Dave Chappelle performs at Radio City Music Hall on June 19, 2014, in New York City. 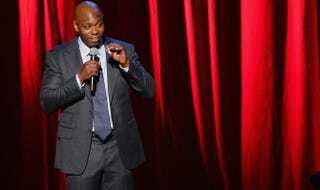 Nearly a week after Dave Chappelle sang the praises of Kanye West, the multiplatinum rapper made an unscheduled appearance Friday at the comedian’s nine-night stand-up engagement at New York City’s Radio City Music Hall, the Huffington Post reports. West’s performance included “New Slaves,” “Gold Digger” and “Jesus Walks,” the site says. During an appearance on Friday, June 13, on The Tonight Show Starring Jimmy Fallon, Chappelle recalled hearing West perform in 2003 on The Chappelle Show and thinking he was going to be successful. While West’s was an unscheduled performance, Chappelle’s other shows are set to include guest appearances from Nas, the Roots, Erykah Badu and Janelle Monáe, the site says.